With over 35 years of quality precision stamping, Standish Precision Products is a name you can trust. 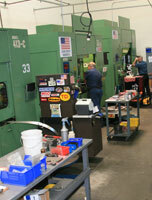 Standish Precision Products is known worldwide for custom drawn precision stamping. Our I.C.O.P (independent cam-operated plunger press) system allows low cost production, benefiting aircraft, automotive, electronics, HVAC controls, hardware, irrigation, orthodontics, and plumbing industries. With our years of experience and our I.C.O.P. system, we offer the benefit of low cost and high quality that cannot be surpassed. View our company overview to learn more about the Standish advantages and our company.